SOLICITATION. The Director, Bajio Cleaner Production Implementation Program in Leon, Guanajuato , Mexico is soliciting consulting services in support of the Bajio Cleaner Production Implementation Program. SUBMISSIONS: Offerers are encouraged to submit concise, but descriptive, proposals in Spanish language. Proposals will be addressed to Mr. Joseph R. Chapa , President, USMCOC Guanajuato Chapter, Leon, GTO and submitted by email as an attachment: jrchapa7@aol.com. All proposals for consulting services must be received by Mr. Chapa by 6 p.m on June 3, 2005 . All technical questions concerning this announcement should be addressed to Mr. Chapa by email. PROPOSAL CONTENT: Proposals shall consist of two separate parts. Part I shall provide the technical proposal and management approach, and Part II shall address costs. The proposals shall be prepared on 8.5 x 11 inch paper, with one and one-half line spacing or double spaced, in at least 11-point Times New Roman font but no larger than 12 point font. Part I of the proposal should, as a minimum, describe the proposed services thoroughly. In particular, Part I of the proposal shall include: (a) a cover page including Bajio CPIP CS number, proposal title, technical and administrative points of contact including mailing addresses, telephone numbers, electronic mail addresses, and facsimile machine numbers; (b) a one-page summary; (c) a statement of work detailing the scope of the proposed work and specific utilization of any subcontractors; (d) a description of results and products; (e) a list of the milestones and schedule; (f) a statement of the technical rationale that substantiates the schedule and justifies the overall technical approach of the proposal; (g) a (not-to-exceed) one-page summary of any proprietary claims to results, prototypes, or systems supporting and/or necessary for the use of the services, results, and/or prototype (if there are no proprietary claims this section shall consist of a statement to that effect); (h) a section describing relevant capabilities, accomplishments, and work in these or closely related areas along with the qualifications of any proposed subcontractors; (i) a management plan describing the overall approach to management of this effort, including brief discussions of total organizations, use of personnel, project/function/subcontractor relationships, and planning, scheduling and control practices. Part I must be no longer than 10 pages in length, including description of qualifications of performers, with no more than two pages per performer. Appropriate references should be cited. Proposals with Part I in excess of 12 pages may not be reviewed. Proposals of fewer than the maximum number of pages will not be penalized. Part II of the proposal shall be no longer than 8 pages and shall include a one page summary. Costs shall be supported by detailed breakdowns of labor hours by labor category and tasks/subtasks, materials, travel, and other direct and indirect costs. Bajio CPIP: CS 1-05. Environmental Consulting Services for the Bajio CPIP Launching Event: a Keynote Presentation on Cleaner Production in Small and Medium Enterprises in Mexico . A technical keynote speaker is required to deliver a 30-40 minute presentation on cleaner production implementation in small and medium enterprises in Mexico . The speech must be delivered in Spanish language to about 40-50 participants including Mexican national and state government officials and academia and other dignitaries, SMEs and the media. The consultant must have an expert knowledge of environmental management tools and cleaner production methodology. Direct work experience in Mexico is preferred, but relevant experience in other countries will be considered. 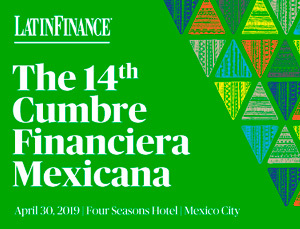 The estimated duration of this service requirement is one day and the estimated cost is $500 U.S. plus travel to the launching event site in Leon, Guanajuato , Mexico on the day prior to the event and the day following the event, and per diem. Bajio CPIP: CS 2-05. Half-day Cleaner Production Awareness-Raising and Promotion Workshop for SMEs. Consultant services are required for a technical presentation in Spanish language for awareness-raising and promotion of cleaner production methodology that decreases SME waste products and costs of production processes and increases SME profitability in Mexico . Each workshop will have duration of one half day and will include up to 30 participants. During the first year of the Bajio CPIP a minimum of three and a maximum of six half-day cleaner production awareness-raising and promotion work shops will be conducted in the several states of the Bajio Region, including Aguascalientes, Guanajuato, Jalisco, Queretaro and San Luis Potosi, no more than one workshop per state. The complete set of workshops will be conducted within a three – month period. In the second year of the Bajio CPIP a minimum of two and a maximum of five half-day awareness-raising and promotion workshops will be conducted within the five states of the Bajio Region. There is no requirement for this workshop in the third year of the Bajio CPIP. The Bajio CPIP will pay for the cost of the facilities and the logistical support, including the materials for the workshop. The estimated cost of this consulting service is $250 U.S. per workshop plus travel to and from the workshop site and two days of per diem. Bajio CPIP: CS 3-05. Half-day Cleaner Production Awareness –Raising and Promotion Workshop for the Media. Consultant services are required for a technical presentation in Spanish language for awareness-raising and promotion of cleaner production methodology that decreases SME waste products and costs of production processes and increases SME profitability in Mexico . This workshop is for media personnel. One workshop will be conducted in Leon, GTO and one workshop will be conducted within a different state of the Bajio. Both awareness-raising and promotion workshops will be conducted within a one – month period. This requirement is for the first year of the program only. It is estimated that each workshop will include up to 30 participants. The Bajio CPIP will pay for the cost of the workshop facilities and logistical support, including the materials for the workshop. The estimated cost of this consulting service is $250 U.S. per workshop plus travel to and from the workshop site and two days of per diem. Bajio CPIP: CS 4-05. Half-day Sector-Specific Cleaner Production Awareness – Raising and Promotion Workshop for SMEs. Consultant services are required for a technical presentation in Spanish language for awareness-raising and promotion of cleaner production methodology that decreases SME waste products and costs of production processes and increases SME profitability in Mexico in the following industrial sectors: automotive, chemical, hospital, hotel and tanning. A minimum of two and a maximum of four workshops will be conducted in the Bajio during the first year, and two to four during the second year of the program. All workshops in each year will be conducted within a three-month period. One workshop will be conducted in Leon, GTO and the remaining workshops in other states of the Bajio, no more than one per state. It is estimated that each awareness-raising and promotion workshop will include up to 30 participants. The Bajio CPIP will pay for the cost of the workshop facilities and the logistical support, including the materials for the workshop. The estimated cost of this consulting service is $250 U.S. per workshop plus travel to and from the workshop site and two days of per diem. Bajio CPIP: CS 5-05. One-day Sector-Specific Cleaner Production and Supply Chain Management Workshop for SMEs. Consulting services are required for a one-day technical workshop in Spanish language on cleaner production methodology that decreases SME waste products and costs of production processes and increases SME profitability in Mexico in the following industrial sectors: automotive, chemical, hospital, hotel and tanning. The workshops will also demonstrate multinational supply chain cleaner production requirements and the benefits that can accrue to SMEs by complying with multinational supply chain requirements for cleaner production. A minimum of two and a maximum of four workshops will be conducted in the Bajio during the first year of the program, and two to four during the second year. All workshops in each year will be conducted within a four – month period. One workshop will be conducted in Leon , GTO, and the remaining workshops in other states of the Bajio, no more than one per state. It is estimated that each workshop will include up to 20 participants, generally CEOs or other top management personnel of SMEs. The Bajio CPIP will pay for the cost of the workshop facilities and the logistical support, including the materials for the workshop. The estimated cost of this consulting service is $500 U.S. per workshop plus travel to and from the workshop site and two days of per diem. Bajio CPIP: CS 6-05. Development of a 12-Module Training Course in Cleaner Production Methodology for Environmental Consultants. Consulting services are required for the development of a twelve-module training course in environmental management and cleaner production methodology for industrial processes for SMEs in Mexico with gross annual revenue of up to five million U.S. dollars. The purpose of the training course is to certify environmental consultants in cleaner production methodology in order to qualify them as consultants in cleaner production for SMEs. The entire course will be in Spanish language. Each module will be up to 5 days in duration, and the total length of the training course must not exceed three months. This training course will become the sole property of the Bajio CPIP. The training course will be conducted once per year in each year of the Bajio CPIP, with the initial course to be conducted in Leon, Guanajuato. The course materials will include a CD version as well as a paper training manual. The estimated cost for development of the course is $500 per module for a total of $6,000 U.S. plus the cost of materials for 20 students per course. Bajio CPIP: CS 7-05. Conduct a 12-Module Training Course in Cleaner Production Methodology for Environmental Consultants. Consulting services are required to conduct a twelve-module training course in environmental management and cleaner production methodology for industrial processes for SMEs in Mexico with gross annual revenue of up to five million U.S. dollars. The purpose of the training course is to certify environmental consultants in environmental management and cleaner production methodology in order to qualify them as consultants in cleaner production for SMEs. The entire course will be conducted in Spanish language. Each module will be up to 5 days in duration, and the total length of the training course must not exceed three months. The Bajio CPIP will provide the training course and materials. The training course will be conducted once per year in each year of the Bajio CPIP. The course materials will include a CD version as well as a paper training manual. The Bajio CPIP will pay for the cost of the workshop facilities and the logistical support, including the materials for the workshop. The estimated cost for presenting each module is $1500 U.S. and the estimated cost of the total course is $18,000 U.S. plus travel and per diem for each module. Bajio CPIP: CS 8-05. Development of Sector – Specific Training Courses in Cleaner Production Methodology for Environmental Consultants. Consulting services are required for development of five separate training courses in environmental management and cleaner production methodology for sector – specific industrial processes for SMEs in Mexico with gross annual revenue of up to five million U.S. dollars. The specific sectors include automotive, chemical, hospital, hotel and tanning. The purpose of these training courses is to certify environmental consultants in cleaner production methodology in order to qualify them as consultants in cleaner production for SMEs in these sectors. Each course will be in Spanish language. Each module will be three days in duration. Each training course will become the sole property of the Bajio CP Center. The training courses will be conducted once per year in each year of the Bajio CPIP. The course materials will include a CD version as well as a paper training manual. The estimated cost for development of the course is $500 per module for a total of $2500 U.S. plus the cost of materials for 20 students per course. The Bajio CPIP will provide the training facilities and logistical support for the course. Bajio CPIP: CS 9-05. Conduct a Sector – Specific Training Course in Cleaner Production Methodology for Environmental Consultants. Consulting services are required for conducting five different training courses in environmental management and cleaner production methodology for sector – specific industrial processes for SMEs in Mexico with gross annual revenue of up to five million U.S. dollars. The specific sectors include automotive, chemical, hospital, hotel and tanning. The purpose of these training courses is to certify environmental consultants in cleaner production methodology in order to qualify them as consultants in cleaner production for SMEs in these sectors. Each course will be conducted in Spanish language. The training courses will be conducted once per year in each year of the Bajio CPIP. The initial course will be conducted in Leon, Guanajuato. The course materials will include a CD version and course materials. The Bajio CPIP will provide the training facilities and logistical support for each course. The estimated cost for presenting each module is $1000 U.S. plus travel and per diem. Bajio CPIP: CS 10-05. Conduct 25 SME Assessments to Select Candidates for Cleaner Production Implementation Projects. Consulting services are required to assist the Bajio CPIP Technical Coordinator in conducting his assessments of small and medium enterprises in the states of Aguascalientes , Guanajuato, Jalisco , Queretaro , and San Luis Potosi in the automotive, chemical, hospital, hotel and tanning industrial sectors. The purpose of the assessments is to determine the suitability of the SMEs to participate in the Bajio CPIP. Each assessment is estimated to require a half-day of services. The estimated cost of the services is $250 per half day for a total cost of $6250 U.S. plus travel and per diem. This requirement is for each year of the program.